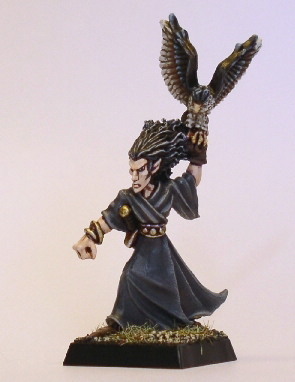 The robe is painted using a basecolour mix of Chaos Black and Bleached Bone. Shading with a watered down Purple Ink/Chaos Black mix, and highlights are done adding Bleached Bone to the basecolour. The hawk was painted using three colours for the feathers. The black areas are Chaos Black highlighted with my specially-mixed stone troll blue-grey (!) and final highlights adding Space Wolf Grey. The warm mid-tone brown is a basecolour of Graveyard Earth hightlighted with Kommando Khaki. The light brown was done with Kommando Khaki highlighted adding Skull White.